During one of our planning meetings for 901 Day, Jen (901 Day co-founder and all around awesome lady) and I got distracted from planning by talking about food. Specifically, all of the ways in which one could, if so compelled, modify a Gibson's donut. A few ideas were tossed around: donut cocktail party skewers (sort of like those little tomato mozzarella basil bites, but far less healthy), various desserts, and one sandwich that could either change lives or end them: the Maple Bacon Donut Panini. You'll need at least one maple bacon donut from Gibson's, a green apple and some kind of soft cheese (I recommend brie). You'll also need a knife, some butter, a spatula, and – like in all good southern recipes – a skillet. First, cut the donut in half. This is surprisingly difficult, especially if the donut is fresh. I recommend a bread knife and a slow, light hand. Slice the apple so that you've got big, thin round slices. Place these over the hole on the bottom slice of the donut. 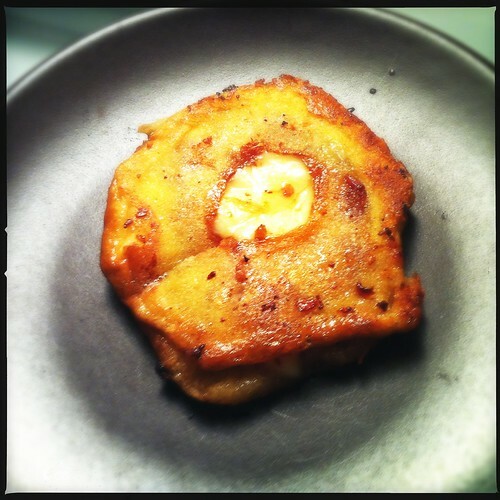 Then, slice enough brie to cover the apple – it'll melt and spread out onto the donut. Lastly – and this is the important part – take the top half of the donut, the one with the bacon on it, and flip it so that the bacon maple side touches the brie and apples. If you've got access to some sort of panini press or Foreman Grill, you could always use that to cook your sandwich. At the Crawford house, things are a little more low-tech (and low budget), so I used the grilled cheese method: melt butter in a skillet, use a spatula to press the sandwich down and flip it over occassionally. It's done when the top of the sandwich is browned and the cheese is melted. Here's the truth about the Maple Bacon Donut Panini (or, as my friend and fellow taste tester John named it, "The Agony and the Ecstasy"): it tastes kind of amazing. The sugar in the donut caramelizes into a light, crunchy creme brulee sort of crust when you fry it. When the icing and bacon meld with the cheese and apples, the results are kind of magical. They're also fantasically, comically unhealthy – this is a once a year food, if that. Here's a short video of the taste test. Please excuse my dog, Henry, barking in the background. I had to banish him to the backyard after he tried to eat my work. In conclusion, I'm glad I did this. I think. I can't exactly recommend that you do the same, but godspeed if you decide that you will. I write about what’s going on with Memphis music, food, arts, events, sports, people, and culture. Memphians love Elvis and barbeque with a passion that must be seen to be believed, but there is so much more to this place. Don't miss out on all the Memphis goodness! Shop for all the ILM Swag!